Creating drilling templates is always a bit time-consuming. I started drawing the templates using GIMP, but it turned out to be very laborious. So I tried out drawing them with LibreOffice Draw, which turned out to be the better way. However, I'm starting to collect the various drilling templates I've worked out and will provide them to you. All the templates in this post are "verified" - which means I've used them at least once for drilling and got everything in the right place. I will add new templates every time I've created and verified a new one. Allright, here's a snapshot of the guitar effects I'm currently using for my band. The case is a customized "Harley Benton PB705 Pedalcase" from Thomann. Well, it's a very cheap one, but for the moment it matches my requirements. I cut some holes into the board to countersink an electrical socket and a Harley Benton Powerplant. All DC wires for the effects are installed under the board to minimize the cable chaos on the surface. The effects are "fixed" with a hook-and-loop fastener - not the best solution, but sufficient. A few weeks ago I ordered some PCBs at madbeanpedals.com. Madbeanpedals offers several PCBs for simple up to difficult DIY guitar effects projects. Order and payment was uncomplicated and handled by PayPal. Brian mailed the boards within a few days; the shipping in total took about eleven days from Nashville to Germany. I have been suprised by the amazing quality of the PCBs - heavy material, double sided, tinned, plated-through and mounting diagram printed on the upper side. Soldering turned out to be very easy on those boards. The pots can be mounted directly on the boards; the build instructions contain precise drilling templates - if printed in the correct size, so check before drilling. The build instructions in general are very good; options (e.g. replacements for the components) and possible mods are explained comprehensible. The only thing missing is a wiring diagram - but to be honest, if you understand how a true bypass works or at least know how to wire one, you won't need this. Everything else - power source, ground, in, out, ... - is printed clearly on the board and as the pots are meant to be mounted on the PCB, wiring them is also obvious (if required). You can download the build instructions on the website, check it out! So, as a conclusion, madpeanpedals offers PCBs and project documentations of good quality for reasonable prices and shipping rates. Delivery period as expected from USA to Europe. I will post images of my builds as soon as possible. The RAT clone quickly became one of my favorite distortions on my effects board. It is easy-to-build and fits into a 1590B case. 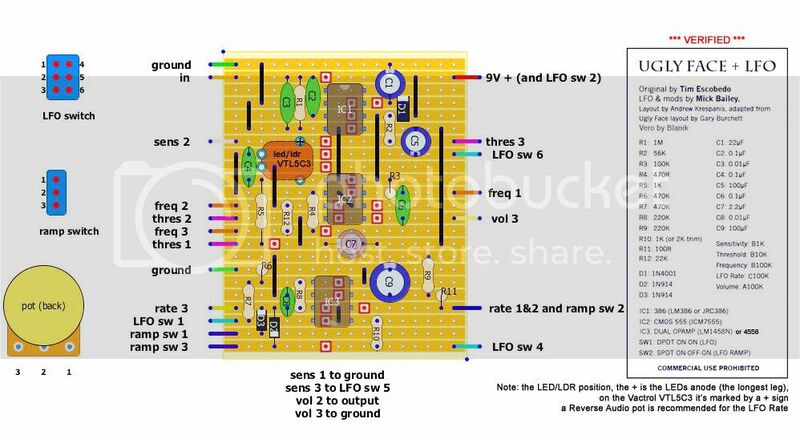 My build of the pedal is geared to the schematics, parts list and PCB layout from Tonepad. It seemed to me to be a very simple build so I decided to solder it to a perfboard. The only modification I did was to use a linear pot for the filter instead of a logarithmic - I tried out both, but preffered the linear responsivity. For some historical background check out wikipedia's page about the Pro Co RAT. This distortion really sounds great, but I still have to try out the original from Pro Co - it's not very expensive (around 70€). This post is part of my posts series "DIY For Absolute Beginners". Click here for the introduction. Today I'd like to talk about the equipment, apart from the electronic components, which is required or may be useful when you start to build your own stompboxes. I'm starting a new post series which is meant to provide some information on building DIY effects for people who have never built one before, but are considering to do so or for people who have already started and want to do the next step. I'm going to update the posts in this category every time I think I got new, useful information. I'm not an electronics expert, but I've built already several effects and like to share some of the knowledge I gathered since I started. You may use the information on your own risk! If you find any errors, please leave a comment in the appropriate post! You may also suggests new topics you're interested in by leaving a comment below in this post. OK, got it. But how to start? Another circuit well-known in the DIY community is the UglyFace designed by Tim Escobedo. After listening to some sound samples on the web, I got curious how it will sound "in real life". So I decided to build my own clone. Although my first draft of the original circuit on breadboard went totally wrong - it didn't sound in any way like the samples I heard, but very crappy instead - I wanted to give it another try. Searching round the web, I found this Youtube video with a link to an adapted version with LFO control as a stripboard layout. I built it exactly by the layout and as a result I got a very flexible and amusing effects pedal. No matter if you will be able to use it in a band context, this pedal is worth a build! By a growing set of guitar effects I started to look for a power supply that is able to provide power for several stompboxes. Most of these power supplies cost a lot of money, so I was a bit suprised to find the Harley Benton PowerPlant Junior for a very low price (around 30€), but with a very good customer rating on the Thomann Online Store. Harley Benton is the private brand of Thomann and offers musical instruments and parts for low prices. Sometimes those products are cheap in price and quality, but sometimes good value for money. My first project not built from a kit was the "Nurse Quacky", an envelope controlled filter (or auto-wah) derived from the EHXDoctor Q from the 1970s. I got the schematics and some more information about it from home-wrecker.com. This is my build report of all steps from scratch to the finished stomp box. My first step was to put the circuit on an experimental board to try out the sound of it and to decide if it's worth being build. The HotCake distortion pedal has been invented by Emlyn Crowther in 1976 and since then has been used by many well-known guitarists like, for example, Noel Gallagher of Oasis. I decided to build this pedal as my third project after watching a few reviews on Youtube and considering it to be the distortion I've been looking for. I decided for the kit sold by UK-Electronic, as I already gained positive experience by two previous projects. Again the build instructions have been very well and the assembling has been easy. Designing the look, my clone became the "Hot Brownie". The second guitar fx project I decided to build was the Big Muff Π, Green Russian version. Like the Tonebender MK-III I ordered this kit again from UK-Electronic. Building the effect has been easy as I could gain some experience from the previous project. If you're interested in the building manual check the product page for the download. Looking at pictures of the original versions from EHX/Sovtek I instantely knew what I wanted it to look like: an accessory of the soviet army. So, of course, I kept the olive-green color of the original effect and added a red star around the LED to the design. Finally I called my clone "Vodka" ;-) and labelled the box in russian lettering. I love the sound of this stompbox - great sustain & tone control. Combined with a Les Paul (humbucker on neck position) and an Orange amp, it really gives a good stoner rock feeling. I will provide some sound samples as soon as possible. The Tone Bender MK-III has been my first DIY guitar effect. It's a fuzz type of distortion. I ordered the "Tonebender MK-III" fuzz kit at the online shop of UK-Electronic. Some days later, the kit arrived: an aluminium case, a PCB and a few electronic components, switches, plugs, etc. The building instructions have to be downloaded on the website and are pretty good, supported by some images of different steps; they also contain drilling and layout templates. I started soldering the same day; as I didn't have much experience in soldering, it took me more or less 3h to put all the components onto the PCB. The next day it took another 3h to do the wiring of the effect. Plugged it into the amp and ... nothing. Damn frustrating. Checked everything again, but didn't find the error. If something like this happens to you, the best thing to do is put it away and check again later. The day after I found the mistake really quickly. I confused the tip and ring contacts of the output. Corrected it and Yeah! - it worked. For the layout I used the printing template contained in the manual. I printed it with an ink jet on a white self-adhesive film, put some clear coat on it and glued it onto the top of the case. Disclaimer: all media on this page is my own work and licenced under CCL, if not elsewise stated.